When searching for a Makeup Artist for your event, we are pretty confident that you will have questions. We’ve constructed these Frequently Asked Questions for those attending special occasion events and brides-to-be. Special occasion events include: prom, birthday celebrations, maternity photoshoots, baby showers, etc. Brides-to-be would typically need makeup for an engagement photo session, Bridal Shower, or Bachelorette party. What brands of products do you use? Many different professional products that you won’t typically hear about on the market like Kryolan, Limelife, Sonia Roselli, Tatcha, and Embryollise. Do you sell any of the products that you use? Not at this time. We will be offering this service in the future. Should I bring my own makeup for you to use? Absolutely NOT! We take sanitation very seriously! All of the items in our kits have been disinfected and sanitized per cosmetology board standards. Your eyes are the focal point of your face and embellishing them is definitely worth it! Although eyelashes are optional, we encourage EVERYONE to wear them. They add definition and dimension to your eyes and enhance the structure of your face. We offer several styles and many lengths to accommodate every eye shape. Although they aren’t necessary, they look absolutely fabulous if you are taking pictures. They will not pull out your natural lashes and we use glue made specifically for lashes. Can you tell the difference in the picture below? Payments are set up in two installments; the deposit and the final balance. The deposit is paid when the appointment is made. You are NOT able to book an appointment without a paid deposit. The final payment is due the day of service before the service begins. Will You Travel To Me? Yes, we can travel to you. The rate for a full face makeup application with travel is $105 if travel is within a total of 25 miles of Raleigh, NC. If outside of 25 miles, a small fee will apply. 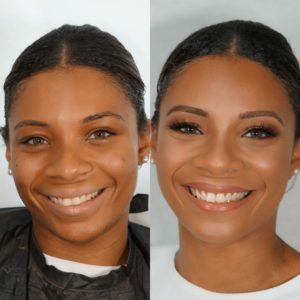 Full face makeup application can take anywhere from 45 minutes to an hour. Do you have specific packages and pricing for weddings? Can we see sample of your work from weddings? A minimum of an hour and a half is what is needed to prepare the bride to walk down the aisle, and a maximum of one hour for each bridesmaid. Can I have a makeup trial? Absolutely! It is encouraged so all the logistics are taken care of. Do you accommodate large bridal parties? We can accomodate a bridal party up to 5 people comfortably. Bridal parties greater than five, will require a second Artist. Will you stay at the wedding and do touch-ups throughout the day? If services are needed for all day touch-ups, we will stay for a fee of $85/per hour. Can you replicate a makeup look I found on Pinterest or Google? We encourage our brides to provide 3 makeup “inspiration” images so we can collectively customize your wedding day look to your face anatomy. From the 3 inspiration images, we are able to determine similarities for personalizing your wedding day makeup.